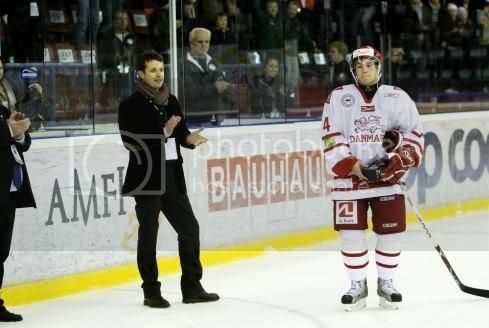 Frederik attended the Olympic ice hockey qualifier between Denmark and Norway on February 8, 2009. Denmark had beaten Kazakhstan and would have made Danish sporting history had they qualified for the 2010 Winter Olympics. Denmark had never competed in ice hockey at Olympic level, but unfortunately, it was not to be, despite strong national support, including Frederik's. The Crown Prince's support was greeted with pleasure by the Danish players, who said it was great he travelled to see them play. They said it drew extra attention to the sport. Norway won the match 5-3 and Frederik was seen sending SMS's during the game.